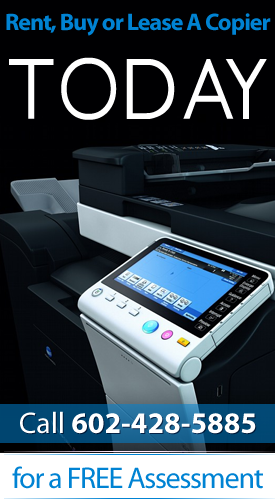 Chandler Copiers has convenient and easy-to-use multi-function copy machines. Their versatility is unsurpassed. They offer the ability to rapidly phone, fax, print and copy from a home business or small business to clients. If you are looking for an affordable copier company in Chandler, you’ve found the right place. Not sure if you should purchase a copy machine quite yet? Our customer service and sales staff can help you decide if it is more affordable to lease or rent a copier. Renting a copier is a great choice if your small business isn’t ready to commit to purchasing a specific model. Try out different makes and models of copiers to see which ones are best for your type of business and which ones your staff prefers to work with. Try leasing a copier for a limited period of time before you make a commitment to buy. Chandler Copiers is a leader in digital imaging solutions.Our satisfied customers all over the world understand the benefits of excellent reputation and reliable products. If you haven’t been in the copy industry for a few years, technology has really advanced. Today’s reprographic machines allow you to do more than copy. Prepare presentations electronically and annotate them with touch-screen features. Highlight key features on work plans, edit documents or mark-up hard copies of documents and fax or email them quickly to others working on the project team. Don’t sacrifice high resolution when converting documents to PDF and emailing them to clients. If you are trying to find an established copier company in Chandler, we have the expertise and knowledge your business needs to succeed. Chandler Copiers has experienced sales staff that can help you make the right choice for your business needs. Whether you are establishing a new location for your company or expanding to additional locations, your needs for copy machines and office equipment could be rapidly changing.Looking for a copy supplier in Chandler? Call Arizona copiers. Compare our lease, rental and purchase options with the competition and you’ll find we have what you need to grow your business without the capital expense. Win the next bid your company submits because you have the most professional looking bid package. Our copier machines make glossy brochures, sharp fact sheets and high-resolution color images. Make hard copy packages or email electronic documents to beat tight deadlines.Arizona copiers has what you need to propel your business to a new level.